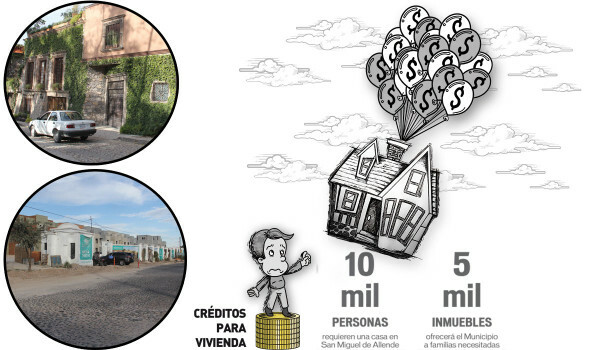 In San Miguel de Allende, those who have access to an Infonavit loan are unable to acquire their own house, since the cheapest ones that are offered in the American Capital of Culture are around $1,300,000 pesos, and for the Infonavit to make a loan that reaches that figure, the worker must earn $50,000 pesos per month (a salary that most Mexicans don’t have). The government has the plan to offer little more than five thousand affordable housing options to people who can not prove income and who do not have access to an Infonavit or ISSSTE credit. For those who do have access to this loan, paradoxically, there are no houses. A worker affiliated to the IMSS who reaches the points for an Infonavit loan and earns between 2,300 and 8,000 pesos per month, can access an amount between 206 and 376 thousand pesos to acquire a home. The problem is that in San Miguel de Allende there are no properties in that price range. Currently there are more than 6 thousand houses under construction, ranging from medium to luxurious housing, none of them affordable for an Infonavit loan. The official said that a private company needs to offer homes worth between 700 and 800,000 pesos, so these citizens could access the possibility of acquiring a house they can afford. “The land is very expensive. that is the problem, Gonzalo Gonzalez explained,”there is no cheap land to build a house in that price range. Considering the price of land, developers will not be able to offer a house worth between 700 and 800 thousand pesos. The cheapest houses in San Miguel sell between 1,300,000 and 1,400,000 pesos “. This peculiarity results precisely from the success of the real estate sector in the region, the most profitable industry in the state, even more than tourism. When the concept of boutique housing arrived in San Miguel de Allende in the year 2000, buying a second home in this city was an attraction for foreigners and some Mexicans who saw in this town, the perfect place to rest. “Although SMA has been a popular spot since the 70s, it reached its peak with the arrival of the baby boomer generation”, according to Juan Manuel Horta, president of the Mexican Association of Real Estate Professionals in San Miguel. Today the real estate market is positioned as the strongest sector, which aims to continue growing between 3 and 5 percent a year, recognized as the business that leaves the greatest economic spill, between 60 and 70 billion pesos a year. In the past administration, the municipal government granted 28 permits, which are in process; nine have an urbanization license, three trace licenses, 12 land use licenses, two already have a permit to sell and two just started the corresponding procedures. Together they total 11 thousand housing units in total.